Wayne Rooney has denied all the rumours suggesting he had a training ground bust-up with United’s young starlet Marcus Rashford. The Manchester United captain has been severely out of form lately, and has therefore remained out of Jose Mourinho’s starting line-ups in the Premier League. Moreover, there have also been reports of Mourinho wanting to sell Rooney the first chance he gets, so as to begin a squad overhaul. Amid such troubling times for the England skipper, some controversial rumours from the past have reemerged – those stating Wayne Rooney was involved in some altercations in training with youngster Marcus Rashford at the start of the season. Rashford has maintained a consistent presence in the Manchester United first team ever since he made his debut against FC Midtjylland last season. The 18-year-old also seems to be a favourite of Mourinho’s as well, and is frequently deployed on one of the wings by the Portuguese. The reason behind this alleged bust up between the two England internationals never really came to light, but some believe it had something to do with Rashford’s quick rise in the pecking order at Manchester United. However, reliable journalist Neil Custis has now revealed that Rooney himself had denied the rumours of any problems between him and Marcus. “He (Rooney) was the right man to take the captain’s armband, too. Younger players look up to Rooney. “When there was a rumour he had a bust-up with Marcus Rashford earlier this season, he was quick to pull me to one side to point out it never happened. 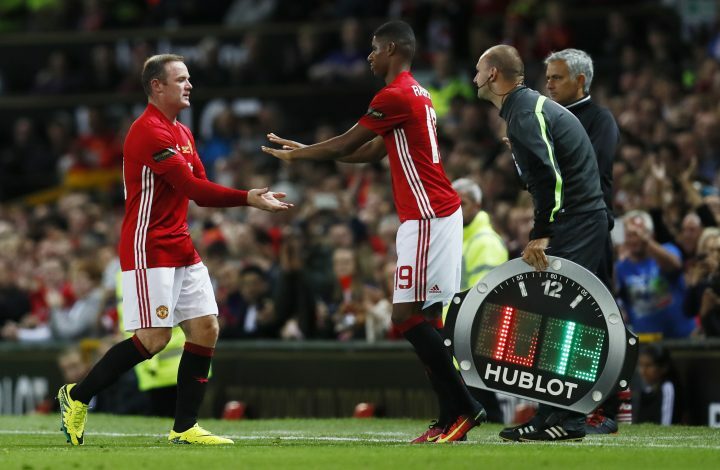 Rashford, after the alleged incident, was also full of praise for the standards Rooney has set at Old ­Trafford.